Nearly all of Apple's bands were able to be ordered up until Monday with the purchase of an Apple Watch Series 2 —but most options have been out of stock for some time. The move is likely to simplify Apple's supply chain, but at the expense of "out of the box" flexibility for the consumer. The previous offerings, including the Classic Buckle, Leather Loop, and Link Bracelet are still available, but now only sold separately. Quick stock checks of Apple Retail stores show some old stock with bundled bands other than the Milanese Loop or Sport Band still able to be purchased, but with spotty availability. 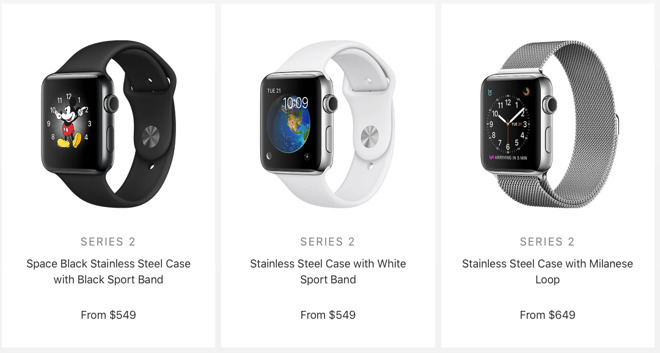 Apple authorized reseller B&H also has inventory available in several styles with no sales tax collected outside NY and NJ, according to the AppleInsider Apple Watch Series 2 Price Guide. A source within Apple Retail, speaking on condition of anonymity, told us that while some Apple Stores were instructed to send back their non-compliant models under the new order, some were allowed to sell-through existing stock. The move comes in conjunction with an overall expansion of Apple Watch bands from Apple, with a new series of bands including stand-alone Nike Sport bands, more Hermes bands, and an assortment of new Woven Nylon bands released on Tuesday. Apple also revealed a new 9.7-inch iPad replacing the iPad Air 2, special edition (Product)Red iPhone 7, the doubling of storage on the iPhone SE without changing the price of the device, and a new Clips app for social media video generation.